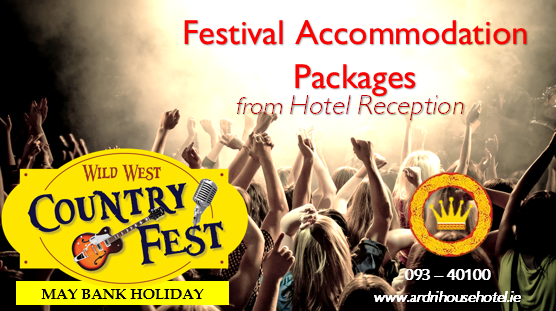 The Wild West Country Music and Social Dancing Festival is the biggest country music festival to hit the Wild Atlantic Way, the village of Kilconly is located only 15 minutes from Ard Rí House Hotel, where Kilconly Community will host Irelands Top Country music performers over 3 excitement filled nights in the Big Red Barn. We are the closest Hotel to the Event and each year welcome guests from all over Ireland as they descend on the biggest night of Social Dancing West of the Shannon! This year's festival takes place during the May Bank Holiday Weekend, for 3 nights. Lineup yet to be announced. Book now to avail of our Best Direct Offers!